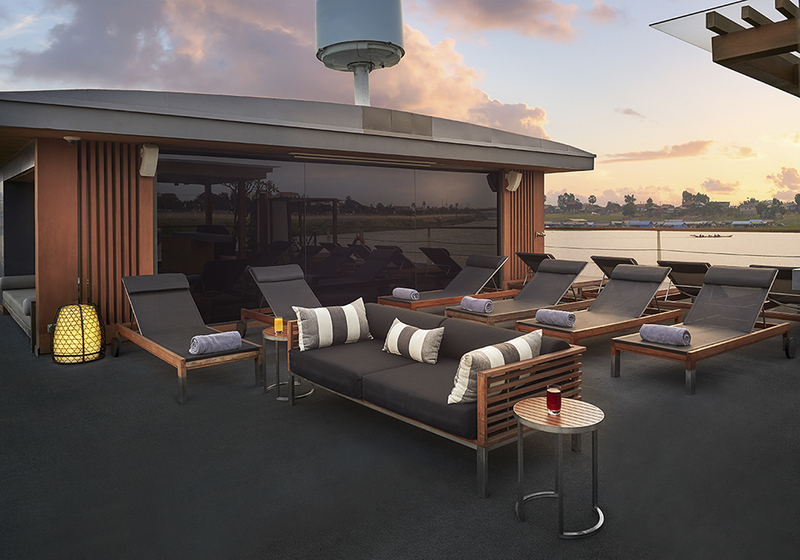 RV Mekong Pandaw, built in Rangoon in 2002, is known as the most spacious ship with a wider promenade deck, a bigger dining hall and many more public spaces for passenger than any. 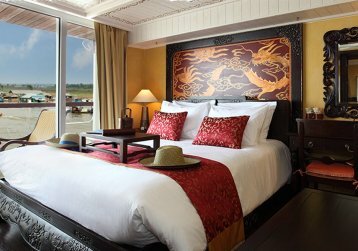 Rejuvenating in 2012 and adding facilities such as gym, spa and library in lower deck, RV Mekong Pandaw is becoming the most splendid ship on the Mekong Delta. Passengers can embark the ship between 14.00 and 18.30. Rest of day at leisure. Overnight in Phnom Penh city port with its lively bars, restaurants and night life. 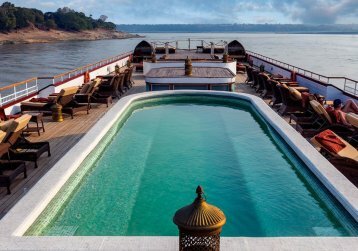 Sail up the Tonle River to board our expedition vessel, the Pandaw Explorer, to visit Koh Okhna Tey, or ‘silk island’ to study the entire silk making process from worms to weavers. There will be a demonstration of the ancient Khmer martial art of Bokator. Return to ship and return down the Tonle River to turn up the Mekong at the confluence. Evening lecture on Angkor and Khmer culture. Morning visit to Koh Trong Island a small Mekong River hamlet which can be explored by bicycle or ox cart with a real immersion into Khmer rural life visiting local schools and English classes then visiting a reforestation site where you can leave your mark by planting your own tree. Passengers should feel free to donate items for use in the schools such as books & pens etc. After lunch, moor off Kratie and continue to the dolphin grounds by local boat where we will observe the elusive Irrawaddy Dolphins. Sail downstream to moor at Kampong Cham for disembarkation and road transfer to Siem Reap. Embark on your Pandaw at Kampong Cham following a road transfer from Siem Reap (Angkor). The vessel will proceed upstream to moor midstream for cocktails and to meet key crew. Sailing downstream all morning, with lectures and film presentations, past Phnom Penh and up the Tonle River to board our expedition vessel, the Pandaw Explorer, to visit Koh Okhna Tey, or ‘silk island’ to study the entire silk making process from worms to weavers. There will be a demonstration of the ancient Khmer martial art of Bokator. Return to ship and return down the Tonle River to turn up the Mekong at the confluence. Evening lecture on Angkor and Khmer culture. After a full buffet breakfast, we will disembark in Cambodia’s capital Phnom Penh. Transfer from Meeting Point to ship. No transfers in Phnom Penh, ship docks in city center at Sisowath Quay. Transfer from the meeting point in Saigon to My Tho Port. After boarding your Pandaw we sail downstream to Ben Tre and anchor midstream. In the afternoon, there is a lecture on Vietnamese life on the Mekong Delta. During cocktail hour passengers are entertained by an indigenous dance group and meet your key crew. Travel by sampans through mangroves and bamboo groves to the fruit orchards of Ben Tre. In these local artisans are at work and are invite visitors into their homes for tea, fruit and honey products made from their own honey. This is an area rich in bird life and on our return journey we travel by horse cart through the lush countryside. After lunch, the ship moors off Cho Lach island for pot making and further glimpses of Delta life, agriculture and local Viet hospitality including a culinary lesson in making traditional Banh Xeo. After breakfast, there is a short coach journey to the Gao Giong ‘green oasis’ with its bird sanctuary. Here a diverse selection of water and egrets that gather in the tens of thousands across the Duong Tharp Muoi or ‘Plain of Reeds’. Rowing boats traverse the canals to take us to see the principal nesting areas. After returning to the boat we cruise upstream to Con Phuoc Island. We Moor in a small canal off Con Phuoc Island and go ashore to explore the island by Xi Loi seeing basket production and visiting a 100-year old Catholic Church as well as local woodworking artisans. Afternoon, explore the labyrinthine canal system around Tan Chau to visit a Taoist temple where the monks will read fortunes. Continue through local villages by Xi Loi stopping off to help locals tend their fields before stopping off to visit a fish farm and earn merit by releasing fish back into the Mekong. Border crossing formalities take up much of the afternoon and during this stationary period there is an optional tour of the working ship and fruit carving classes on deck. Disembark in Cambodia’s capital, Phnom Penh, after breakfast. Embark the ship for lunch. The check-in time should be no later than 12.00 noon, as we need your passport to process the immigration formalities for the border crossing. Overnight in Phnom Penh city port with its lively bars, restaurants and night life. Early sailing to the Vietnam border for formalities and during this stationary period there is an optional tour of the working ship and fruit carving classes on deck. Afternoon, explore the labyrinthine canal system around Tan Chau to visit a Taoist temple where the monks will read fortunes. Continue through local villages by Xi Loi stopping off to help locals tend their fields before stopping off to visit a fish farm and earn merit by releasing fish back into the Mekong. In the morning sail up a small canal to moor off Con Phuoc Island and go ashore to explore the island by tuk-tuk seeing basket production and visiting a 100-year old Catholic Church and local woodworking artisans. After a short cruise downstream in the afternoon we take a short coach trip where we visit Gao Giong ‘green oasis’ with its bird sanctuary. Here a diverse selection of water birds and egrets that gather in the tens of thousands across the Duong Tharp Muoi or ‘Plain of Reeds’. Rowing boats traverse the canals to take us to see the principal nesting areas. After breakfast the ship moors off Cho Lach island for pot making and further glimpses of Delta life, agriculture and local Viet hospitality including a culinary lesson in making traditional Banh Xeo. Upon return to the boat we take a cruise downstream to Ben Tre. Where we travel by sampans through mangroves and bamboo groves to the fruit orchards of Ben Tre. In these local artisans are at work and are invite visitors into their homes for tea, fruit and honey products made from their own honey. This is an area rich in bird life and on our return journey we travel by horse cart through the lush countryside. Moor at My Tho for road transfer to Saigon. Transfers from meeting point to ship. Travel by sampans through mangroves and bamboo groves to the fruit orchards of Ben Tre. In these local artisans are at work and are invite visitors into their homes for tea, fruit and honey products made from their own honey. This is an area rich in bird life and on our return journey we travel by horse cart through the lush countryside. After lunch, the ship moors off Cho Lach island for pot making and further glimpses of Delta life, agriculture and local Viet hospitality including a culinary lesson in making traditional Banh Xeo. Afternoon, explore the labyrinthine canal system around Tan Chau to visit a Taoist temple where the monks will read fortunes. Continue through local villages by Xi Loi stopping off to help locals tend their fields before stopping off to visit a fish farm and earn merit by releasing fish back into the Mekong. Border crossing formalities take up much of the afternoon and during this stationary period there is an optional tour of the working ship and fruit carving classes on deck. Silver Pagoda followed by the National Museum with its marvelous collection of Angkorian statuary. Afternoon optional visit to the Killing Fields and Genocide museum or take a tuk-tuk to explore the riverfront and finish with High Tea at Raffles Hotel. Overnight in Phnom Penh city port with its lively bars, restaurants and night life. Morning visit to Koh Trong Island a small Mekong River hamlet which can be explored by bicycle or ox cart with a real immersion into Khmer rural life visiting local schools and English classes then visiting a reforestation site where you can leave your mark by planting your own tree. Passengers should feel free to donate items for use in the schools such as books & pens etc. After lunch, moor off Kratie and continue to the dolphin grounds by local boat where we will observe the elusive Irrawaddy Dolphins. Morning orientation of Phnom Penh by cyclo visiting the Royal Palace and Silver Pagoda followed by the National Museum with its marvellous collection of Angkorian statuary. Afternoon optional visit to the Killing Fields and Genocide museum or take a tuk-tuk to explore the riverfront and finish with High Tea at Raffles Hotel. Overnight in Phnom Penh city port with its lively bars, restaurants and night life. At Pandaw we pride ourselves on offering a great choice of local cuisine and exotic foods. We source supplies and ingredients as locally as possible, always in accordance with strictly-monitored environmental health standards. Breakfast is a buffet, while lunch features a buffet, plus soup, salad and a desert table, with the main course served at the table. Dinner is by waiter-service at the table. We are happy to cater for individual dietary preferences. Passengers who prefer not to be served hot or spicy foods are offered delicious European-style alternatives and vegetarians are especially well catered for. Other special diets may be accommodated, by prior arrangement. Our chefs know that most passengers want to sample versions of the best, most characteristic dishes of each country they pass through. A barbeque beach party on the sands around a bonfire in winter.